Just getting the X-Men to save the world was never enough for the makers of the franchise - there were always plans to deviate a bit from the action and to delve deep into the minds of the leaders of the two opposing mutant camps, Professor Xavier and Magneto. What began as an introduction to the two of them as young men, in X-Men: First Class, was the beginning of a trilogy. This is not common knowledge, and maybe it was a last minute decision once the producers and writers gauged the reaction to the movie mentioned above. Good for us, though, because we are once again willingly subjected to the younger mutant leaders, and their efforts to save human beings from themselves make for far more interesting discussions than all the mindless violence that the other stories revolve around. In X-Men: Days of Future Past, the second in the trilogy, the world is in apocalyptic mode in the year 2023. Mutants need to be destroyed, and this state of affairs have been set in motion by none other than Raven, who later became Mystique (Jennifer Lawrence). Human beings are insecure about their own existence, and have been carrying out these mutant hunts for 50 years now. What happened was this - way back in 1973, military scientist Boliver Trask (Peter Dinklage) constructed the Sentinels, robots who hunted down the almost-human population of super-talented individuals. Before he could set his operation in motion, Mystique killed him, but she was captured, and her DNA was used to arm these robots with her chameleon-like powers. In 2023, sworn enemies Charles Xavier (Patrick Stewart) and Erik Lehnsherr (Ian McKellen) have joined hands and united the two factions of remaining mutants to fight the Sentinels. However, their forces are fast dwindling, and the only solution they can come up with is to go back to the past and prevent Mystique from killing Trask. Kitty Pryde, a. k. a. Shadowcat (Ellen Page), is the only one who can facilitate time travel, but it is still a risk to go back that much in time without facing physical and mental meltdowns. 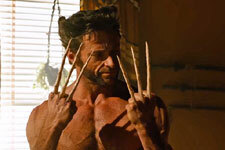 Which is why Logan, or Wolverine as he is more popularly known, volunteers to go. To find Mystique before she kills Trask, in 1973, Wolverine has to first convince the bitter young Xavier (James McAvoy) and the imprisoned Magneto (Michael Fassbender) to get together. With a little help from Peter Maximoff a. k. a. Quicksilver (Evan Peters) and solid support from Hank McCoy a. k. a. Beast (Nicholas Hoult), Wolverine sets out on his mission. What he does not realise is that not only is Xavier a difficult person these days, and Magneto is never to be trusted, but also that this journey that he has undertaken will evoke some painful memories. Time travel is always a risky device in the narration of a story, and this movie deals with it in a very indifferent manner. One has to pay close attention to the goings-on to understand what exactly is at stake. The initial escape of the hiding mutants from the Sentinels is a little confusing, but it is necessary to concentrate because the rest of the movie depends on it. Needless to say, the narrative keeps jumping back and forth between 1973 and 2023, and although the two worlds are very different, there is still a sense of jarring lack of continuity at times, especially towards the climax, when the intercuts become more regular. The idea of human beings threatened by the existence of a mutant population is not a new one, and especially not in the X-Men series. Thankfully, the director does not play on the issue more than necessary. Ironically, this the only movie that actually deals with heavy duty machinery that can wipe out the mutants. The screenplay concentrates a lot on the humane characteristics of the mutants, and makes them the victims of a scared and self-doubting race, thus proving, in the process, the superiority of the former. Another plot in the script is the triangle between the younger Magneto, Xavier and Mystique - although it is not a love triangle. Xavier cannot get over the betrayal he felt in the previous movie, when Magneto and Mystique went against him. It haunts him, so when he meets with them in this story, his lack of self-confidence is enhanced. However, it is Magneto who seems to have more influence over the other two, and he uses it to his advantage. The writing could have explored these relationships a little more, but one guesses that the makers expect the audience to be familiar with the stories of the previous movies. Wolverine is the protagonist, no doubt about it. He is the person who drives the story, who gets people to do the right thing. For a change, he does not fly into temper tantrums just because he can, and is sensible in his dealings. The humour, too, comes from him, because the others are too self-absorbed with their concepts of greatness. The lack of a single antagonist, or somebody who is completely black in character, is rankling, but think of this as an in-between movie that will eventually lead to a bigger adventure. 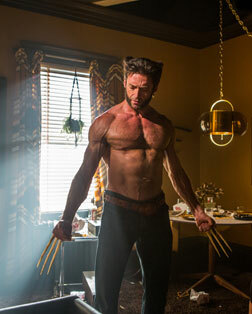 Hugh Jackman, as mentioned above, is the hero of the film, but a rather understated one. He gets the best lines, and he even has a glimmer of hope towards the end. Peter Dinklage is nothing like his character Tyrion from the Game of Thrones series. He is suave, yes, but also quite hot with his original American accent, and his no-nonsense portrayal of an ambitious, arrogant man. The bromance between the characters played by James McAvoy and Michael Fassbender has to be seen to be believed. The two actors share a sizzling chemistry, and you wish they had more scenes together. While the former plays a convincing victim of circumstances, with penetrating blue eyes that highlight his pain, it is the latter whom you cannot tear your eyes away from. Michael Fassbender is intense and a delight to watch, even when he does the bad boy bit. Jennifer Lawrence behaves like a petulant child throughout the movie, but her scene with Michael Fassbender reminds us why she is considered such a talent (a lot of that has to do with her co-star's acting abilities, but never mind that). The other actors do their bit. Patrick Stewart and Ian McKellen cannot deliver the passion that the younger selves of their characters portray, but they are essential to the series. Halle Berry is wasted, and so are the other cameos - not enough to make a mark. Evan Peters is a joy, and full of fun. Nicholas Hoult's Beast is interesting, but he deserved to explain his fascination with Mystique. The two worlds in the movie are very different, but the production designer does not concentrate too much on the apocalyptic one, or so it seems. The sets are almost shoddy, as opposed to the careful detailing done in the world of 1973. The Sentinels themselves are interesting, though, in both worlds. The costumes are above average, but since everybody knows how the characters of the X-Men series dress, there are no surprises. Except maybe for the clothes and look that Charles Xavier dons as a young man. It is worth watching X-Men: Days Of Future Past in 3D. It just seems natural to, and not because the VFX is great (which it is not, really). Some of the visuals are stunning, and that has a lot to do with the dedication in the work of the cinematographer. The music is patchy, especially in the background. The sound editing is not too great. As for the editing, a few irrelevant sequences should have been chopped off. It is rumoured that the movie would have gone on for longer, and that many important roles were anyway chopped off. All that extra footage will be in the DVD, though, as the makers want to show the movie in its original entirety. X-Men: Days Of Future Past has an upcoming sequel, 2 years from now, named X-Men: Apocalypse, that will continue the story of the younger Magneto and Xavier. This movie was just a filler, of sorts, and the best is yet to come, or so one hopes. You have to wait 2 beastly years to watch it though, but then again, it is always worth visiting the world of Wolverine and his ilk. Be the first to comment on X-Men: Days Of Future Past! Just use the simple form below. fullhyd.com has 700,000+ monthly visits. Tell Hyderabad what you feel about X-Men: Days Of Future Past!